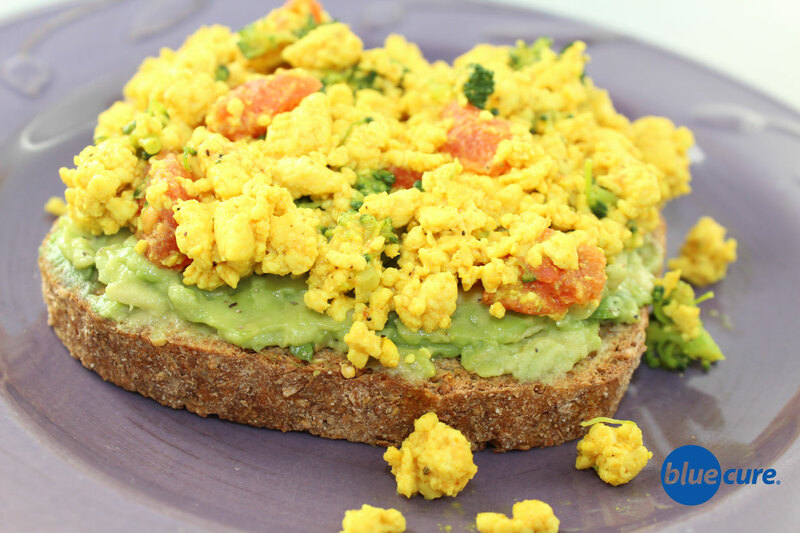 Tofu scramble on avocado toast is a great way to start the day! A balance of healthy fats, carbohydrates, and protein that’s totally satisfying and absolutely delicious. While chowing down on this tasty breakfast, read-up on the benefits of including whole soy foods in your diet! Wash and chop the veggies. Sauté the onions until translucent. Add in the broccoli and tomatoes. Cook until desired texture. Set aside in a bowl. Lay out a towel on a cutting board or plate. Place the tofu in the middle of the towel and cover the tofu completely. Using your hands, press down on the tofu to squeeze-out excess water. Place the tofu into the pan. Cook on medium-heat. Crumble the tofu using a wooden spoon and allow the tofu to lightly brown. Once the tofu has started to brown, add the nutritional yeast, turmeric, garlic, black pepper, and salt. Add more spices as needed. Mix in the vegetables and remove from the heat. Toast the bread. Top with sliced avocado, and the tofu scramble. Serve with a side of fresh fruit.